Manuel in his accompanying post calls today's election in Spain "Zapatero's election to lose", meaning by this that the opposition scarcely seems credibly poised to win, and the best chance they have is if Zapatero somehow or other manages to clutch defeat from the jaws of victory. But there is another sense in which one might think that this was Zapatero's election to lose, since given the scale and importance of the economic problems which are steadily arriving, I sometimes find it hard to understand how anyone would actually relish winning this one. There really are occasions when discretion is the better part of valour. Wolfgang Munchau effectively made a similar point in a recent Financial Times Op-ed where he suggested the the winner, whoever that should be, "will spend the next four years cleaning up an economic mess of a scale not witnessed in Spain in modern times". I thoroughly agree. 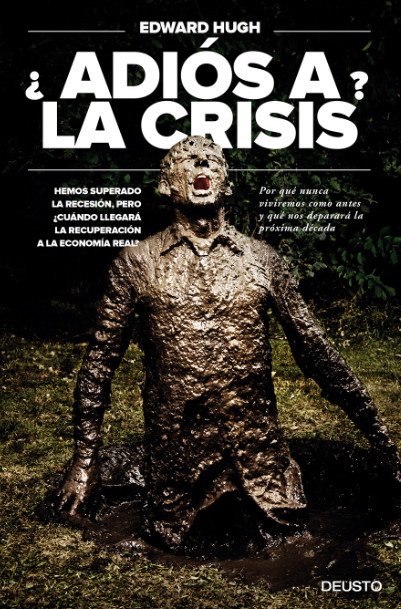 I also agree that Munchau more or less hits the proverbial nail directly on the head when he suggests that "the twin engines of the coming Spanish economic crisis are a collapsing housing market and a current account deficit, now at 10 per cent of gross domestic product". As he also points out, these two are related since it has been the inflow of investment which has funded the lending associated with the property boom which has enabled Spain to finance its current account deficit. But now that this flow of funds has all but come to a halt (and the lending with it, see what happened to new bank credit last December in the chart below) it is by no means clear how the deficit is going to be financed. Perhaps the first thing to get absolutely clear in our minds from the outset is that the economic correction which is currently taking place in Spain is very unusual one in terms of what we have become accustomed to in developed economies in modern times, since the transmission mechanism for Spain's current difficulties does not run in simple one-way-street fashion from problems which have their source in the real economy (a correction in house prices for example, or a downsizeing of the construction industry, although both of these undoubtedly form part of the picture), nor does it run from an attempt by a central bank to "burst" some sort of perceived asset bubble or other (Trichet and the ECB's tightening of interest rates), rather the mechanism operates via a direct blow-out in the cylinder-head-gasket of the global financial system, a blow-out which has produced an immediate and direct change in global credit and lending conditions, and in the level of risk appetite which prevails in the securitised mortgages/covered bonds sector of the wholesale money markets (leading to a situation where these markets are now effectively closed to Spanish banks) , and it is this change in financial and credit conditions which is now making its impact felt on the real economy in Spain, with the actual and present danger that these negative consequences for the real economy may then in their turn feed back into the financial sector, in the process creating some kind of ongoing lose-lose dynamic. As I say, such a phenomenon is certainly unusual in a modern European context, although some may wish to point to parallels with what happened in Japan in the early 1990s, and the subsequent "lost decade". I wouldn't go so far at this point as to suggest that Spain is facing a lost decade, although the situation is very very serious (as I hope to show in the charts that follow), and at the very least Spain now faces several "lost years" and a massive macroeconomic structural adjustment. 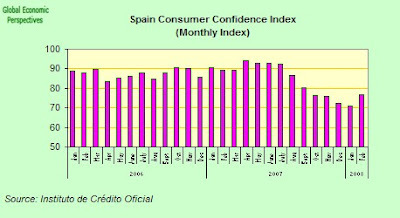 So first of all lets have a brief look at some chart which can give us an idea of what has been happening to the Spanish "real economy" in the last months. Unemployment is up, and substantially so. 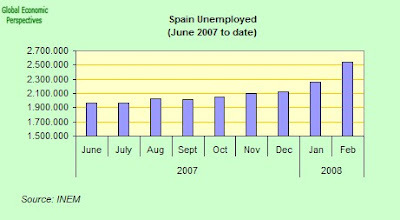 Unemployment in Spain has now risen from something over 1.9 million in June 2007 to something over 2.5 million in February 2008. The figures were up year on year by some 9.9% in February. Regional differences area also imortant, with the year on year rises being very strong in some costal areas, like Valencia (20%) and Murcia (30%). As we can see from the comparative chart, the labour market moved in a positive direction from January 2006 to May 2007, then it turned in June 2007, since which point what we have had has been essentially a one way street of pretty bad news. 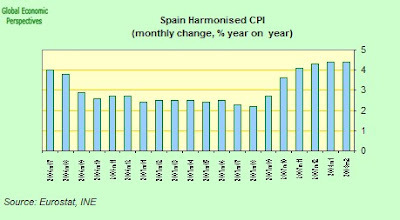 Strangely, while the economy has been slowing and unemployment rising, prices have continued to rise, and inflation has accelerated with the latest flash estimate for CPI inflation in February issued by INE, the Spanish Statistics Office, coming in last week at 4.4% for the second month running. 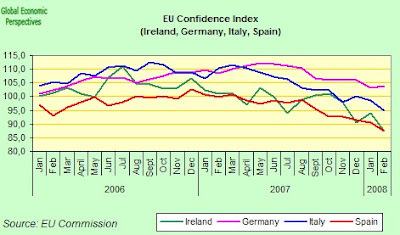 In this context of rising prices and unemployment it is hardly surprising that consumer confidence is taking a big hit, and if we look at the confidence index, we will find that despite registering some very slight improvement for the first time since April last month the general index, which stood at 76.8 in February was still very near to plumming all time historic lows. The European Commission have also recently reported a continuing decline in its eurozone “economic sentiment” indicator in February, with the composite number for the whole zone reaching its lowest level since December 2005. The indicator, which gauges optimism across all economic sectors and is regarded as a reasonable guide to likely future trends, fell to 100.1 points in February from 101.7 in January. While the picture across the eurozone shows considerable variation at this point with France holding up better than most, and Germany (as explained here) is hanging on in better than I personally expected, but Italy is very much in the doldrums already, and the two "construction driven" eurozone economies (Spain and Ireland) are - as can be seen in the chart below - now in strong downward retreat. But it is when we come to the real data that things start to get decidedly hairy. 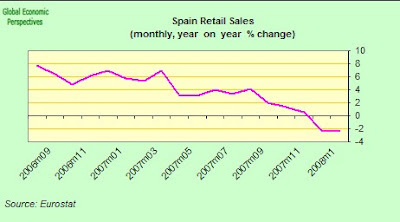 Eurostat have, for example, just published the January retail sales data, and the Spanish numbers do not look good at all. Basically retail sales have now contracted in 5 of the last six months. In January they were down 1.1% on December (seasonally adjusted of course) and 2.4% on January 2007. If you look at the chart there is now a very clear downward line (which resembles more what we have been seeing in Latvia or Hungary in recent months that the kind of data output we are accustomed to from Western Europe), and the only real question is where this will now stop. The slide is evident. Basically this is a reflection of construction and banking sector issues gradually arriving and making their presence felt on the real economy. Spanish manufacturing activity contracted again in February, posting its weakest performance in over six years, according to last Monday's NTC Purchasing Managers Index (PMI). All five component indices of Index (PMI) pointed to worsening conditions as both production and new orders fell in February following the modest growth reported in January. The headline PMI, which measures the general health of Spanish manufacturing, fell to 46.7 -- its lowest since December 2001 -- from 49.8 in January, pushing it further below the 50.0 mark separating growth from contraction. 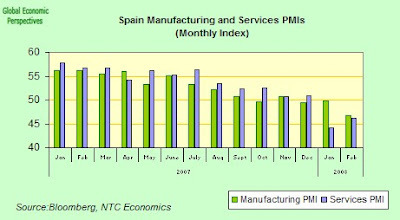 The data from the manufacturing PMI is pretty consistent with the latest industrial production data released by the Spanish Statistics OFfice (INE). 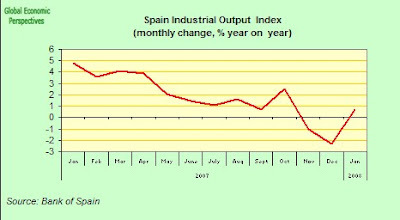 Accoring to the release the Spanish Industrial Production Index - when adjusted for working day effects increased by 0.7% in January when compared with January 2007. Uncorrected the Index was down 0.2% year on year. Activity in Spain's service sector also fell to a record low in February as costs surged while business gave few signs of any kind of bounce back, according to the NTC Purchasing Managers Services Index (PMI) published las Wednesday. Though the headline PMI figure recovered to 46.1 from January's 44.2 (see the chart above), the figure was still well below the 50 mark which divides growth from contraction and was the second weakest reading in the survey's 8-1/2 year history. "Clearly there's a lot of downward pressure on growth," Chris Williamson, Chief Economist at NTC Research is quoted as saying. He added that the survey's forward-looking indicators emphasised the risks of a sharp slowdown in Spain after a long economic boom. A measure of confidence in the business outlook slipped to 59.2 from 59.8 in January (achieving in the process a fall of 14.2 points in a year and a new low for the survey) with respondents stressing their apprehension in the face of increasing economic uncertainty. The new business index recovered somewhat to 45.9 from 43.5 but showed demand still falling. As firms continued to work their way through backlogs of business, employment showed the most marginal growth in 4-1/2 years. I take it that it goes without saying that one part of this problem is now deeply ingrained in the contstruction sector, and even if in this post I want to concentrate attention in two of the more neglected areas of Spain's current embarassment - the real economy and the financial sector - I obviously can't let all this pass by without some mention of what is happening in construction. One small data point here really says it all, and that is the estimate from the IPE business school that in March there some 500,000 unsold new homes in Spain - more or less the equivalent of one year's residential construction output at the old pace. And of course the old pace is now history. Spain's economy is not going to be able to get the old uplift by producing anything like 500,000 new housing units a year anytime in the foreseeable future. We could also look at the December mortgages data, which, as was to be expected, saw a decline in both the value and the number of new mortgages (and it should be remembered that mortgages and construction were still being driven to some extent by the competion of old orders, ie those that predated the advent of the credit crunch in August 2007). The average value of the new mortgages created in December was 161,142 euros - down 1.9% on December 2006, although this number was in fact up 1.4% on November 2007. Perhaps more significantly the number of new mortgages (102,976) was down in December by 26.87% on November and 14.6% on December 2006. As a result of the reduced numbers of properties being newly mortgaged the total value of mortgage loans (16.59 billion euros) was down in December by 25.88% on November and 16.24% on December 2006. We could also try looking at what Wolfgang Munchau calls his favourite current chart (although why anyone would call such an appaulingly depressing picture a favourite is beyond me) - the one originating with Bank of Spain data which shows how building approvals and permits have (and I quote Munchau) "fallen off the edge of a cliff since the end of 2006". As Munchau points out, at their peak in March 2007, house building permits were rising at an annual growth rate of 25 per cent. In the autumn of 2007, their annual change had dropped into the region of minus 20 per cent. The situation in terms of approved starts is even more dramatic, since these rose at an annual growth rate of close to 28 per cent in March 2007. By September the annual rate of change had fallen to minus 66 per cent. 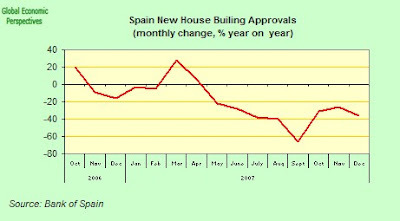 House prices have not fallen significantly in Spain yet, but this is surely only a matter of time, and especially when we come think about the large stock of unsold new homes (estimated as I say at 500,000 as of March 2008) waiting on the books, and the drop in the number of mortgage loans mentioned earlier in this post. So now for the cherry which is currently perched smartly on the top of our Spanish election Sunday pudding: the problem of how to provide suffient liquidity to the banking system to square off the monthly balance of payments deficit. Now Wolfgang Munchau correctly ties-in the capital inflows which have been needed to finance the Spanish housing boom with the huge balance of payments surplus Spain currently runs (Spain needs in the region of 9 billion euros in external finance a month to keep this afloat), but I'm not sure he has yet fully appreciated just what a problem for the Spanish banking sector - and indeed for the whole eurosystem - this financing problem can become, since while he correctly points out that in the Spanish case "there can be no currency crisis....since Spain does not have its own currency", he omits to ask himself the equally pertinet question as to whether or not there could be a (euro-) systemic banking crisis? 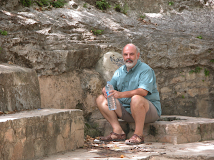 As I try to argue in some depth in this post the answer to that question is that there most certainly can. Perhaps another data point would be useful here. The Spanish banks currently attend the weekly liquidity auctions at the ECB to raise something in the region of 48 billion euros of funding (a figure which is double the 24 billion euro number they needed before the summer). However, as Jean Claude Trichet insistently points out, "there is no question that the Spanish - or any other - banks are being bailed out" at this point. This, like so many of Trichet's statements is entirely true. But it is not the whole truth. That is, there is a bigger picture. And herein lies the problem. It is, for example, also true that the ECB has not changed its rules to accept mortgage backed securities (like the US Fed had to under pressure last August), but this apparent constancy in rules also stands alongside the fact that a banking system which didn't need much recourse to the facility in question has now doubled its use of it, and in a very short space of time. 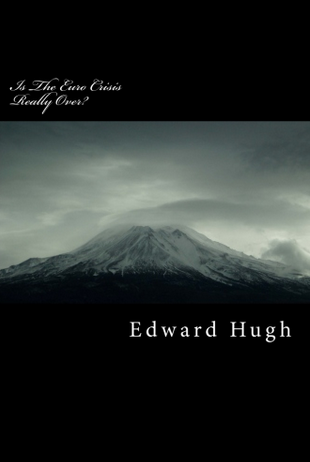 It is also true that Spanish banks were not allowed by the Bank of Spain to set up special purpose vehicles to finance their lending, but again, they set up the cedulas hipotecarias to find another way to do something which, at the end of the day, is not that disimmilar. The argument against SIVs is that off balance sheet lending is likely to be more risky, but in a certain sense (and as I try to argue and explain in my post here on the cedulas system) the cajas regionales have played the role of off balance sheet entities for the principal banks, and since we still don't know how far down the value of the entire Spanish mortgage pool is going to fall, we have no way at this point of making a valid assessment of the level of risk that has been actually taken on board. 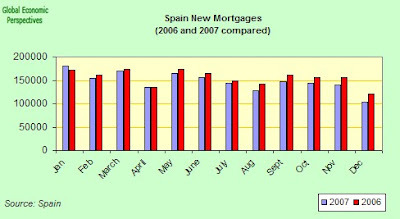 It is also the case that the level of mortgage defaults in Spain is at this point comparatively small, but then again the whole process is only just starting, so it is far to early to say at this point whether or not cover will prove adequate in the longer term, but then again, the problem for the Spanish banking system may not originate in defaults in the first place, but rather from a perceived rise in their risk rating if the value of the entire pool of mortgages on their books starts to decline significantly. 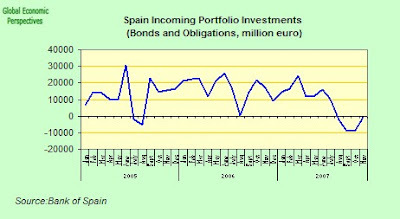 Well if we want to get a first measure of what kinds of problem are looming in the Spanish banking system we could take a look at the activity level of incoming bond purchasing into Spain over the last several years (thanks to the monthly balance of payments data made available by the Bank of Spain). As we can see, on a rough and ready basis the bonds boom really took off sometime in 2002, and it came to a sharp and rather unfortunate end in the middle of 2007 (I would say on or around the 9 August). In any event the height of the boom was in 2005, 2006 and the first half of 2007. Now before going any further with my line of argument, lets just look at one more piece of rather important evidence, the refi interest rate set by the ECB (and which of course regulated 1 year euribor) and the rate of inflation in Spain. 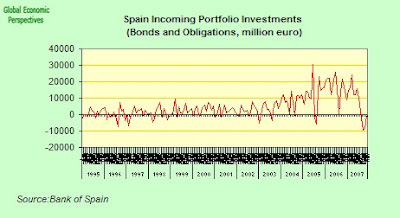 And as we can see here, the take of date for the bonds boom is hardly coincidental, since it more or less coincides with the arrival over a sustained period of time of negative interest rates in Spain, a fact which to a large extent explains the intensity of the housing boom, since under these conditions borrowing money does not seem especially onerous, and indeed it might even be considered illogical not to do so. Now if we return to the task in hand, lets take a close-up look at the most recent years for those bond inflows. As we can see, the last few months is not the first time that these flows have "wobbled", but this time the wobble is much more sustained and, since the wholesale money markets are at this point effectively closed to the Spanish banks to raise money in this way, there are good reasons for imagining that this time the change will be a more permanent one. 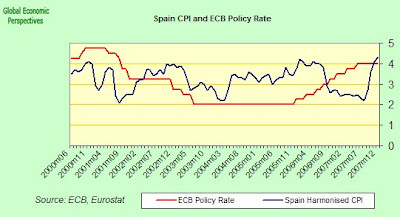 Now, why, apart from the implications for the banking system, is all this so important for Spain? 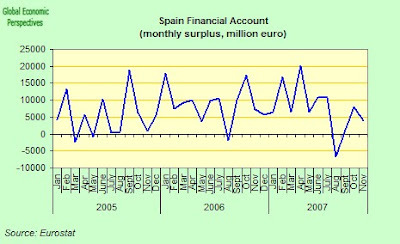 Well lets now take a look at another chart, the one for the current account deficit. And as we can see, the growing consumer boom associated with the construction one had a long term and pretty disastrous impact on Spain's trade balance (and in particular its energy component, all those extra houses use energy remember). And this deterioration in the external trade position has remained, and arguably even gotten slightly worse, even as the economy has started to slow down. Now normally this deficit has been offset by the sum total balance of funds coming in as part of the financial account, but as we can see in the chart below this has also dropped off somewhat since August last year. The consequence of this is that Spain's banks are increasingly having to find the money they need to make the books balance via the eurosystem, and this is basically the significance of that increase in borrowing that the Spanish banks have had to undertake at the weekly ECB auctions (referred to in this post ). 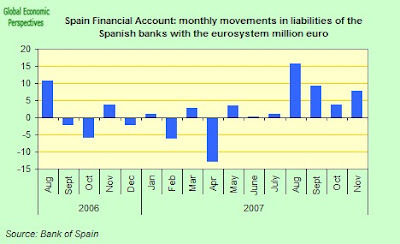 If we look at the chart below, which shows the net asset and liability position of the Spanish banks vis-a-vis the eurosystem, those months when the bars are above the zero line indicate there has been an increase in the amount of money borrowed by the Spanish banks from the eurosystem (presumeably largely or exclusively at the ECB weekly auctions), and this money is essentially needed to settle the monthly deficit in the balance of payments account. 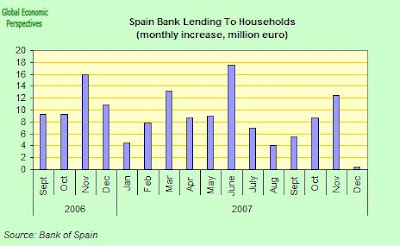 As we can see, prior to August 2007 these quantities showed no particular trend, but since August, and for every month for which we currently have data, the Spanish banks have needed to raise additional money at the ECB. This is really a direct result of the fact that the banks have been unable to sell their cedulas for cash in the global markets. 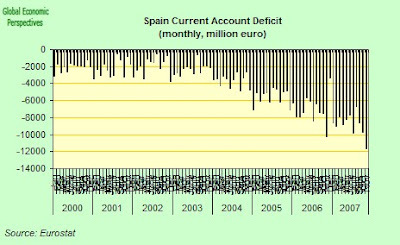 What the Spanish banking system lacks right now is a way to generate cash on a stable basis to meet the needs of the current account deficit. Now as I have been regularly pointing out, another of the very specific characteristics of the way in which the property boom was financed here was the ability of the Spanish banking system to provide very low interest (variable) rate mortgages. Curiously, many commentators imagined that this (variable) component was the greatest rsik element in Spain. That is, they imagined that it was Spain's mortgage borrowers who were assuming the greatest part of the risk here. They were wrong. The risk at present has almost all been inadvertently assumed by Spain's banking system, and this decidedly odd situation has arisen (I'm sure this was never the intention) due to the recourse of Spain's banks to the widespreased use of securitised (or covered) bonds - the so called cedulas - and the provision of variable mortgages at very narrow margins (lets say around 0.75% or 1% over 1 year euribor). Now the banking system considered they were onto a sound bet here, since they in their turn could borrow (thanks to the investment AAA grade often assigned to these bonds, which made them virtually equivalent to government paper) at very favourable rates themselves (normally three month euribor), which meant they thought they were onto a very safe bet. Again they were wrong, since it is just this very global repricing of risk appetite I mentioned earlier, and the reassessment of the AAA rating which was assigned to their mortgage bonds which goes with it, which has produced the problem. Oh, yes, and there's a third little detail which makes all of this just that little bit worse. The different term structures of the lending and the borrowing. Basically the Spanish banks, and especially here the regional cajas who undoubtedly have the lions share of the problem, borrowed short and lent long. The majority of the mortgages issued between 2000 and 2007 were for between 20 and 30 years. Indeed during the last two years of the boom it even became fashionable to offer mortgages over 50 years, so sure did the banks feel of themselves. But they borrowed short. Not the very-short-liquidity type borrowing that we are increasingly seeing Spanish banks having to resort to as they stand in line at the ECBs weekly money auctions of course, but rather the lions share of the borrowing, which was done using cedulas, and normally over a ten year term or even less. That is to say, while the vast majority of the mortgages issued will still be outsanding come 2025, almost all of the bonds which go with them will need to be refinanced, between 2012 and 2017. And here is where we hit the snag, since the money markets which the Spanish banks need to do the refinancing are currently closed to them. These money markets can of course be reopened, but at a price (ie the price of a risk premium), and that is really the bigger half of the snag, since while the debtors are on "variable" mortgages , these are effectively fixed (at 1 year euribor plus something, euribor can of course go up, but it can also go down, as I think we are about to see in the next moves at the ECB), so the borrowers, it turns out, really do have a yardstick that lets them know what they are into. This is not the case with the lenders (the banks) however, since while we do not know what eventual risk premium will be built in to fund Spanish banks (this in part depends on how far and how fast property prices fall, and how much difficulty they have maintaining their mortgage pools), we do know that the days when they could fund them at a simple euribor 3 month rate (y punto) are now well and truly over, and we could even contemplate the possibility that if bad goes to worse, and even worse, and then worse again, then they could be asked to pay even more than they are recieving from their mortgage paying clients! And the amounts of money are not small. One good recent estimate put the total quantity the banks will need to "roll over" in the space of about 5-7 years at some 300 thousand million euros. And cash may well not be that easy to find since, while money may be attracted by offering higher interest rates, it is not clear what the funds would be needed or used for (rolling over existing liabilities should be more or less neautral here) and the rate of increase in bank lending has been slowing steadily all through 2007. A country with a large and sustained current account deficit - as we can see in the case of the United States - can do one of two things. It can tighten money and credit conditions in order to try and use an indirect method to slow internal demand, or it can allow the value of the currency to slide (as we have seen with the dollar) in a direct attempt to reduce the deficit. Well, as Munchau poinyted out, Spain has no autoctonous currency of its own to let slide, so the only real alternative is to squeeze internal lending to try and reduce the deficit, and in the meantime lean on the ECB for money. The contraction in lending needed to reduce a deficit of this magnitude might be very large indeed, and the consequences for the real economy would be substantial, so it is to be anticipated that in the short term some other alternatives makeshift will be sought. What these alternatives might be are currently a complete mystery, since for reasonably obvious reasons little of the discussion which must currently be taking place behind the curtains has found a public airing at this point, even though we are in the midst of an otherwise heated electoral debate. All we can do is watch, stupefied, and wait, as the organisers of the concert prepare to emerge from the cabal to let the public know what gets to happen next. So as Spaniards go to the polls today they might like to reflect on this thought. Given what we have seen in the course of this post, Spain currently runs the risk of being the first modern developed economy to suffer the twin issue of a sudden-stop in the credit system and a dramatic slowdown in the real economy at one and the same time, yet in the interminable election debates which have taken place over the last month or so this singular and intriguing little detail has scarcely been mentioned. Of course there has been plenty of talk of the "construction slowdown", and finger pointing about who exactly is responsible, but the full measure and extent of the problem has been scarcely aluded to, even in the faintest whisper. Question: how do you know they are holding a referendum on the government's difficult and unpopular economic adjustment package in Hungary on Sunday? Answer: take a look at what happened in the Hungarian financial markets on Friday. It should not have been too difficult to see all this coming, yet financial analysts seem to have been strangely silent on the potential implications of the latest political twist in Hungary's ongoing economic agony. And where they have not been silent they have generall been trying to downplay its importance. Only last week Goldman Sachs' Hungarian analyst István Zsoldos was busy reassuring us that the coming referendum would have no lasting impact on the evolution of Hungary's long drawn out economic crisis (although he did admit that the short-term political noise was “likely to intensify"). I beg to differ. I think the consequences of Sunday's vote are going to be important and long lasting (indeed I had the referendum pencilled in in this post as the third of my potential tipping points for Hungary's economy, with the the second one being the last interest rate setting meeting of the central bank, when, of course, they did scrap the currency band), and they are going to be important and long lasting regardless of whether or not the Hungarian authorities manage to plug the now growing breach in their credibility and the value of HUF denominated instruments in the short term. So why is there a problem? Well, anyone with even a passing and cursory knowledge of political and financial crises should know by now that you can't forever fill the growing disatisfaction of a population with their lack of nice fresh bread by sending them over cake for ever. Basically, any government has a limited amount of ammunition stacked in the chamber (which is why you need to be careful how you fire it off) and once your bullets are spent, or you get to fire off as many as you are able before your voters finally get mad, then you need to watch out, since events have a nasty habit of moving swiftly. And this is what is starting to happen right now, before our very eyes in Hungary. 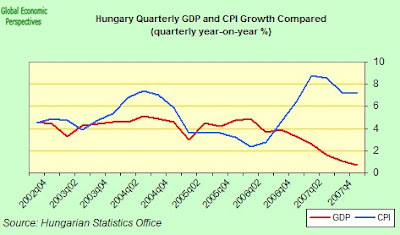 Basically Hungary had a sudden financial crisis back in the summer of 2006, on the back of a massive "twin" deficit (ie fiscal and current account) problem, and subsequent to this the government introduced a series of "austerity measures" principally designed to try and correct the fiscal deficit situation. The core of this package was a downsizing of government spending (including a reduction in services and employment in the public sector), and an increase in social security contributions, charges for the state administered utility sector, and individual charges for clients in the state health and education system. The first two of these have played no little part in generating the dynamic which means that Hungary is now labouring under a 7% inflation rate, while the latter (the health and education charges, and their constitutionality) constitute the core of the issue for Sunday's referendum. Basically the government has become highly unpopular on the back of the package and its evident lack of success in resolving the underlying issues facing Hungary (see chart below, Fidesz is the opposition and MSZP the government) and the opposition are trying (pretty opportunistically in my view) to create a climate of "no confidence" in the government in the hope of achieving early elections. What I am not saying is that voters will be right to reject the parts of the austerity package they are being asked to vote on on Sunday. Far from it. The new social welfare charges may or may not be an intelligent way of adressing the issue to hand, but they do now constitute the symbolic core of the adjustment process, and rejecting them will be tantamount to rejecting the whole process which lies behind them. Hungary is poor, and has a rapidly ageing and steadily declining working population, and you can't give yourself a five star welfare service if you only have a two star economy. There is just no way you can pay for it, whatever the politicians say. So somewhere or other along the line the Hungarian people are going to have to accept that they will have to cut their coat according to their cloth, and this is what Sunday's vote is all about in my book. The problem now is that there are various kinds of realism at work here, one of these is the dynamic needed to face up to a hard and complex reality, and another is the kind of political realism that economic analysts have to factor in to their policy packages, since once citizens and voters get fed up with promised results which continually fail to arive - and this is what is starting to happen now in Hungary and why it is that all those "ever so optimistic" and rosy forecasts which have been busily going the rounds in Brusssels and Budapest of late are really so very very dangerous - then what were once upon a time sobre and calculating people may well become irrational, and economic policy has to take this kind of irrationality into account just as much as it takes the more normal kind of rational inflation expectations into account. Basically I think the Hungarian voters are reaching the limit of their endurance with being sold cake when all they really want is bread, and it is this weariness that we are about to see expreesed on Sunday, after which point, unfortunately, the credibility and legitimacy of the whole present adjusment process may well be increasingly called into question. So why do I call it black Friday? Well yesterday morning the corridors of Budapest were as thick with rumour as they normally are with smoke. Things got off to a very early start (around 10:00 am Budapest time) with Portfolio Hungary announcing that an emergency meeting had been convened between the National Bank of Hungary (NBH), the Finance Ministry and the Government Debt Management Agency (ÁKK). The reason for the meeting was apparently that an "emergency situation" had arisen on the foreign exchange market, with liquidity having become "practically non-existent" and ... "even if contracts were being made, they would normally signal unrealistically high yield levels," as one Portfolio Hungary source is quoted as saying. (This description is so reminiscent of the Paribas statement on August 9th 2007 that liquidity in the european securitised wholesale money market had practically evaporated). The purpose of the tripartite emergency meeting was ostensibly to decide on how to stabilise the market situation by making purchases on the bond market. Effectively this could be construed as being an emergency meeting of the Monetary Council of the central bank in advance of the next scheduled rate meeting due on 31 March. "The NBH has not held an extraordinary rate meeting and there was no extraordinary joint meeting by the NBH and the ÁKK,....The central bank has not intervened into fixed income market processes"
Ferenc Pichler, press chief at the Finance Ministry, was also entered the fray, issuing a statement to Portfolio Hungary rejecting the rumour about a joint meeting. He did acknowledge, however, that ÁKK officials had visited the NBH, but emphasized that talks were on a completely different matter. Later the same morning, however, Hungary's Finance Minister János Veres accepted that the ministry did in fact hold talks with the Government Debt Management Agency (ÁKK) and the central bank (NBH) about the situation in the fixed-income market. He denied, however, knowledge of any central measure - like buying bonds - to be implemented in the secondary market. "There is no need for concern, experts are dealing with the situation," he is quoted as saying. What has provoked all this concern has been the sudden jump in the benchmark three-year bond yields, which rose yesterday to the highest level since November 2004. Traders and analysts were busy speculating that this rise might force policy makers to raise the central banks benchmark interest rate, which is already (at 7.5%) the European Union's second-highest (after Romania), or to start buying back bonds to jumpstart the market after bond trading had suddenly dried up. Bloomberg quote Marian Trippon, an economist at the local unit of Intesa Sanpaolo SpA, as saying "There is no market...Everybody is waiting on the sidelines, afraid to get in. If this is sustained and the government securities market ceases to exist, then the central bank can't watch idly." Hungary's forint was down by more than 1% against the euro late yesterday afternoon and government securities yields leaped by some 20-30 basis points, partly as stop-loss contracts kicked in (forced sales). In the secondary market, yields leaped by 40-70 basis points from late Thursday levels (to levels which are currently around 10%). The forint weakened further during the morning to 266.20 to the euro by 1:30 p.m. in Budapest from 264.44 late on Thursday, but it firmed again in late afternoon trade to around 264 although at the peak of negative sentiment in the morning session it was almost as weak as 267. The yield on the benchmark three-year bond rose to 9.86 percent from 9.27 percent. The yield has now climbed more than 2 percentage points in a month. Market participants generally seem to be now pricing in a rate hike of around 100 bps within the next month. According to data from the Government Debt Management Agency (ÁKK), the yield on the 3-m T-bill jumped by 34 bps to 8.60% today (the base rate is 7.50%). Hungarian bond yields started soaring a little over a week ago following the decision on Feb 28 by Peloton Partners LLP, a London-based hedge-fund firm, to begin liquidating its ABS Fund following "severe" losses on mortgage-backed debt. Then last Friday (29 February) a local bank was unable to sell a bond portfolio which lead the yield on the three-year bond to rise 46 basis points in a single day. Following this the Hungarian debt management agency AKK revealed on March 3 that it was going to decrease the volume of government bonds it offered for sale by as much as 30 percent, while at the same time increasing its auctions of Treasury bills, which are closer to cash and viewed as safer. 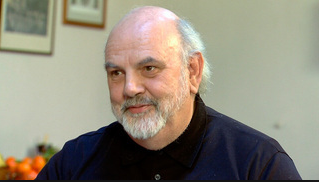 The agency made the decision after a joint meeting the biggest local bond traders. The current situation has been described by Portfolio Hungary as a tsunami of risk aversion. Another indication of the growing scarcity of liquidity in the Hungarian market came on Thursday when the AKK sold HUF 35 bn of 12-month discount T-bills at an average yield of 8.51%. This yield was up another 6 basis points from Wednesday's benchmark fixing and was 28 bps higher than at the previous auction of the same instrument two weeks ago. Hungarian central bank (NBH) Governor András Simor and MPC member Gábor Oblath have both been working hard to try to maintain the central banks credibility in the present situation, in particular by vigourously stressing earlier in the week that the national bank remained strongly committed to achieving its present inflation target. This is viewed as being important, since it is an indication of the bank's intention to remain firm on interest rates in the face of what must be growing political pressure to do something to support weakening domestic demand and to slow down the steady rise in unemployment. Reacting to recent rumours about the possibility of the bank abandoning its target Simor said that such rumours were “ridiculous and unfounded", while Gábor Oblath stressed that the National Bank would obviously need to resort to monetary tightening if prolonged weakness of the forint began to threatenen the target. This may well be where we are now. And central bank policy may well be driven by the need to support the forint rather than address the economic stagflation position - rising inflation and falling growth, see chart below - which is resulting from the collapse of internal demand. But the bank will only be able to maintain this stance for as long as the voters are willing to accept the medicine. Hence the importance of Sunday's vote. We are in the garden of the forking paths, where political and economic dynamics both intercept and separate, and who knows at this point just what pace of evolution we will see in each of them. The principal preoccupation of the central bank, and the spine stiffner for their resolve to defend the currency value, comes of course from household exposure to rapid currency adjustments via their loan portfolio. Nearly 60% of the outstanding loanscurrently being paid by Hungarian households were FX-based at the end of January, and any forint weakening, and especially any weakening against the Swiss Franc (the euro is in fact virtually irrelevant here), represents a substantial potential distress burden for all of those involved. According to figures provided earlier this week by the National Bank of Hungary (NBH) the weakening of the HUF in and of itself boosted household debts to banks by HUF 189 billion in January alone (since with the loans being measured in Swiss Francs, as the forint goes down the loans go up). 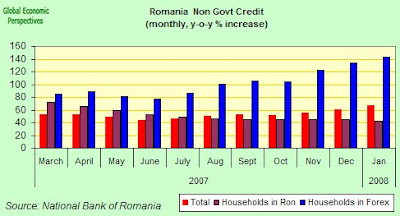 Loans granted to the household sector rose by HUF 274.1 bn or 4.5% (to the new high of HUF 6,190.9 bn) in January. Forint loans were down in fact down (by HUF 16 bn) and all of the increase was in foreign currency loans (up by HUF 290.1 bn). Exchange rate valuation effects directly contributed HUF 189.2 bn, to the increase in the value of foreign currency loans held. This latter development is largely due to the fact that the HUF weakened by nearly 5% against the CHF between end-December and end-January. The forint's depreciation versus the euro was 2% during the same period, but as I said the euro is virtually irrelevant here. Since the HUF weakened by further 4% vis a vis the CHF in February we can be pretty sure that the household burden grew further simply due to the weaker forint in the second month of the year too. 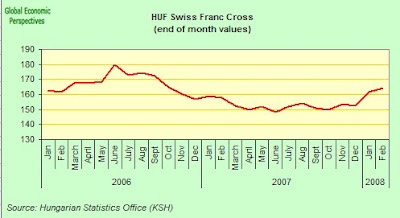 If we look at the HUF-CHF chart for the last couple of years we can see that while the forint has deteriorated against the CHF since June last year, HUF values are still well above what they reached in June/July 2006. 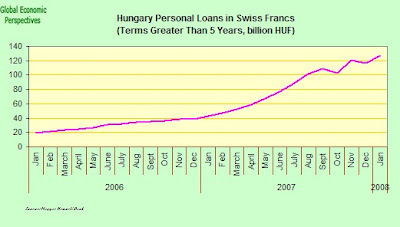 So anyone who took out CHF loans in mid 2006 would still be well protected at this point in time. Unfortunately, if we come to look at the term profile of the contracted loans we will see that foreign loan mortgage finance is heavily weighted towards the second half of the two year period (2006 - 2007). In fact in recent times the share of foreign currency loans within the total has only risen and risen. In January it was up to 57.3% from 55.0% in December. This ratio has been rising continuously over the past two years, and in January 2007 it was nearly twice the level of January 2005. Within aggregate loans to households, housing loans expanded by 4% to HUF 3,260 billion, and foreign currency loans rose to 48.8% from 46.4% as a percentage of housing loans. Of particular note is the fact that the stock of mortgage loans for consumption grew by nearly 13% in January over December, to HUF 1,383 billion, and this increase can be attributed almost exclusively to a rise in the stock of CHF-denominated loans. So basically domestic consumption demand in Hungary is now very much being held to ransom by future movements in the valuation of the forint vis a vis that of the Swiss Franc, with the Hungarian Central Bank's ability to do anything meaningful to soften the severity of Hungary's current economic crisis being reduced to an effective zero. 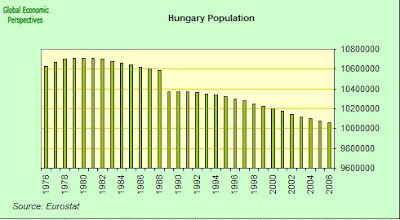 Hungarian citizens should consider themselves lucky in the coming months if they do not face a sharp tightening in monetary conditions simply generated by the need to protect the currency (as a say above the markets a currently pricing in at least a 100 base point increase in the central bank rate). Since movement in the value of the CHF is particularly hard to forsee, and doubly so given its potential role as a safe haven currency in times of global uncertainty, I basically still can't really understand how what would appear to be otherwise reasonably rational and intelligent people (the central bankers and those responsible for Hungary's financial affairs) allowed private debt exposure to currency movements to reach this state of affairs in the first place. 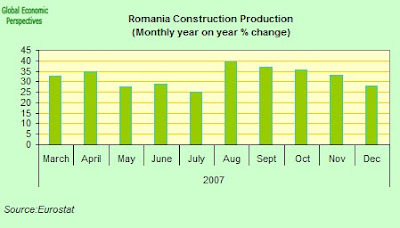 Romania's economic expansion accelerated in the last quarter of last year, raising expectations of further interest rate increases from the central bank in an attempt to contain a strong upward movement in inflation which has been fuelled by a Romanian government increase in end of year spending and a steady household consumption boom. Gross domestic product (according to preliminary data, fuller details on March 12th) rose at an annual rate 6.6 percent in the fourth quarter, the fastest since the last quarter of 2006, and up from 5.7 percent in the previous quarter according to data released by the National Statistics Institute (INSSE) on Tuesday. 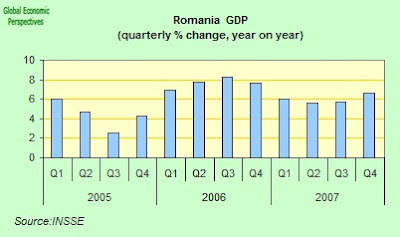 Romania's entry to the European Union on Jan. 1 2007 has seen a sharp increase in foreign investment and inflow of bank funds (and remittances as Romania's workers have moved abroad), and all of this has served to boost wages, lending and consumption to rates which are hard for the Romanian economy to absorb and sustain. Around 10% of Romania's workforce of around 10 million are currently working outside the country (largely in Italy and Spain), and of course many of these potential workers who have been lost are skilled and in the most economically productive age groups. More detailed explanation of this phenomenon can be found in this post). 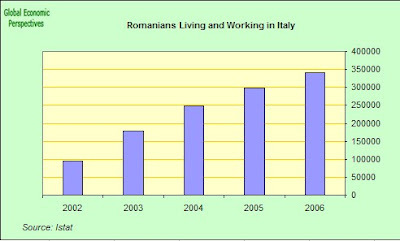 The number of Romanians in Italy has also increased dramatically as the following chart from the Italian statistics office makes clear. 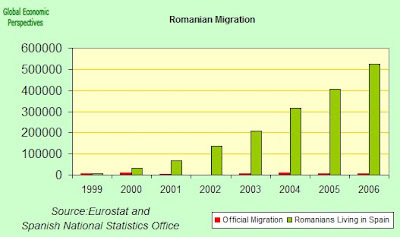 The problem is that while all these Romanians may be working out of the country, they are at the same time busily sending remittances home, and these remittances in their turn only serve to fuel domestic demand even further. 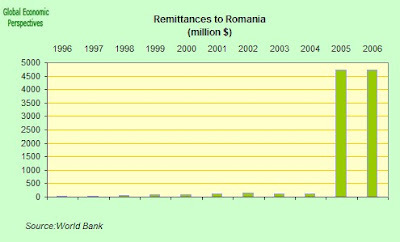 Basically it is hard to get an accurate picture of the actual volume of remittances which are being sent home. One estimate comes from the World Bank, who openly recognise that what they provide is absolute minimum data. Noththeless, and even if the true numbers do not accelerate quite as sharply as the IMF data seem to show (which may be rather an indication of better data in more recent years), a sharp uptick has obviously taken place. 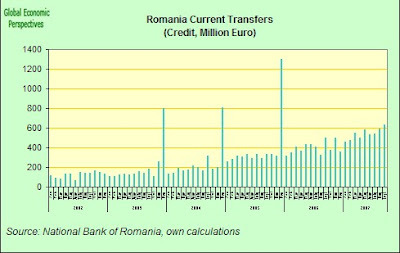 Another way of looking at the remittances issue is to take the current transfers item in the monthly balance of payments data published by the National Bank of Romania, and since this shows a rather smoother upward curve, and one which seems to be closer to the actual pattern of migrant outflow, perhaps it gives us a better general indication. While such data is of limited validity in absolute terms - since it includes other kinds of transfer - in relative terms it can give us a much better appreciation of how the remittances situation has evolved over the years than the World Bank data can. Be all this as it may, the world bank estimate the 2006 volume of remittances to have amounted to some 4.1% of GDP, and that is very large, and with significant macroeconomic consequences as we are currently seeing. I think what no-one had thought about before all this started happening over Eastern Europe was the way in which these remittances could be treated as an income stream and used to finance mortgage borrowing to fuel construction, with all the distortionary consequences we are now observing. 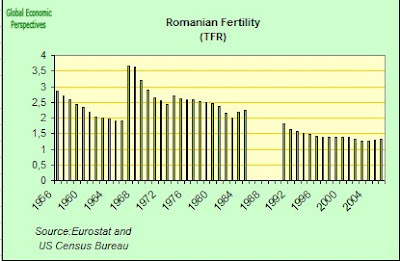 Basically, the lesson from Romania (and elsewhere in the CEE) has to be that if you have very low fertility over a long period you certainly cannot live by exporting labour in the same way that high fertility societies like Philippines, Pakisatn or Ecuador do. 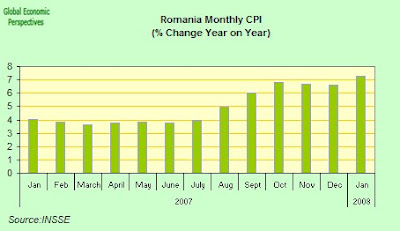 As a result of these pressures on capacity, Romanian inflation accelerated to 7.3 percent in January (up from 6.6 percent in December). Obviously the National Bank of Romania now looks set to raise and raise its main interest rate throughout the first half of this year. More strength to their elbow will come from this weeks PPI reading which showed that producer-price growth in January accelerated for the fifth consecutive month, reaching an annual rate of 13 percent, the fastest pace since August of 2006, according to a separate INSSE report today. The central bank raised its main interest rate to 9 percent from 8 percent at its last meeting on Feb. 4. This was the third consecutive increase, and the bank cited "inflationary pressures that have been amplified by persistent excess demand as a consequence of strong wage increases and fast growth of credit to the private sector". The central bank next meets on March 26 to discuss its main interest rate. One of the problems they will need to be thinking about is private indebtedness since this grew an annual rate of 66.8% percent in January, while foreign exchange loans to households grew at an astonishing and alarming 143.4% annual rate. At the same time net monthly wages have been rising rapidly, with the rate slowing slightly in December but still increasing at an annual rate of around 15 percent. Further indication of the kind of overheating which is currently going on can be found in the fact that retail sales grew in December at an annual rate of 20 percent in December while the construction industry increased its activity by 28 percent on the year. 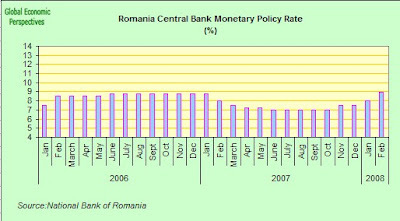 In the face of all of this it is evident that the Romanian central bank will continue to increase its benchmark lending rate, which is already the highest in the European Union. The question is, what will be the objective of these increases? If we look over our shoulders a little to see what has been happening in Hungary, we can begin to see that the Romanian central bank will now be increasingly faced with conflicting policy objectives. Looking just a little further ahead - oh why is it that so many people have so much difficulty seeing what must be coming only round the next corner - at some point what can't continue won't, bank lending criteria will change (indeed it may well already be doing so, since only last week Hungarian mortgage bank OTP announced it was ceasing to offer unsecured loans in the Romanian market due to the high level of loan delinquency) and overheating will transform itself into its opposite, "rapid overcooling", or engine seize-up if you prefer (as we are now seeing in the Baltics). At this point the central bank will face a dilema: whether to lower interest rates to give support to what at that point will be crumbling internal demand, or to pump rates up to defend the currency given the level of exposure to foreign currency loans. There are already signs that just this development may now be taking place. 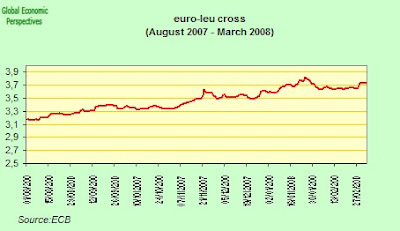 The leu has been under almost continuous downward pressure since last August (see chart below) and JPMorgan Chase are now predicting that by the end of the second quarter the central bank will need to raise its Monetary Policy Rate by at least 1 percentage point to 10 percent simply to keep the leu from dropping to the "never mind the quality feel the pain" level of 4 per euro. This point was made by Miroslav Plojhar, an emerging-market economist with JP Morgan in London in a client note earlier this week. "Problems in the financial markets can cause banks, mainly in Central Europe, to cut credit lines causing problems in financing the current-account deficit and sparking a sell-off in the leu....The fuse needed for it keeps getting shorter" Plojhar said. 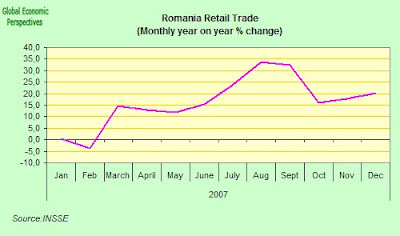 I would add to the problems in financial markets the issue of fears about levels of exposure as tthe overheating turns into its opposite, and the currency exposure of Romanian clients starts to mount. Certainly few would want to repeat the experience the Swedish banks appear to be starting to have as a result of the lending practices of their subsidiaries in the Baltics. Conclusion. 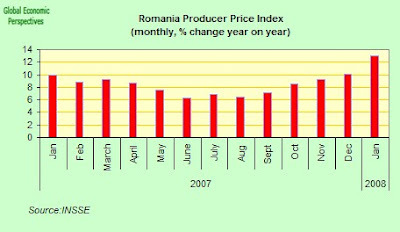 Romania is overheating strongly, not far from a "correction", and needs watching carefully from now on. 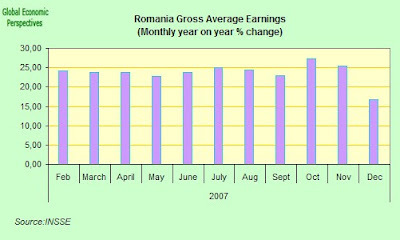 and some more elaboration of the central argument in this post can be found in my Alarm Bells Ringing in Romania post.